My poor oven has been neglected due to my lack of culinary skills. Luckily I can read directions from a Cookie Brownie box that I purchased along with other baked goods from a box as an excuse to buy a pack of eggs I need for Superbowl preparations. As the oven turned my mixed up collection of boxed and bagged and cartoned supplies into warm gooey squares of joy, my nose was filled with baked goods wafting through the room. This is my Simple Pleasure of the Day. 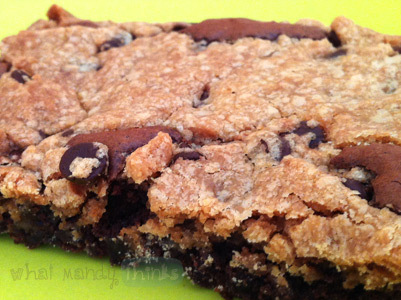 Warm gooey squares of JOY! - Any candle on the market that makes any nose twitch over its overwhelming mass-produced scent. - Any perfume on the market that makes any person more tolerable in comparison to their B.O.-soaked self. - Any pleasant-smelling cleaning product that makes the cleaning process more sensory and less harsh on your insides.